Loyd, the No. 1 overall pick in this year’s WNBA draft, played 11 games as a reserve after asking out of the starting lineup. Mosqueda-Lewis, the third overall pick, has not played in five of the Storm’s 17 games. Angel McCoughtry awoke at 3 a.m. on game days. Playing in Turkey, the Atlanta Dream All-Star didn’t want to miss the TV broadcast of the NCAA tournament being held in the United States. Jewell Loyd caught the eye of McCoughtry, who enjoyed watching the Notre Dame star reach the championship game April 7. There are similarities with McCoughtry and Loyd, whom the Storm selected with the No. 1 overall pick of the WNBA draft in April. Both players have an elite balance of basketball knowledge and athleticism. And like Loyd, McCoughtry was a No. 1 overall pick who was not a full-time starter her rookie season. McCoughtry, selected No. 1 overall in 2009, started just 10 games for the Dream, an expansion team then in its second season. The reason was the team’s veteran lineup, said Tulsa coach Fred Williams, formerly an assistant with the Dream. But McCoughtry’s eye twitched when told why Loyd didn’t start for 11 games: She requested the move. “I … I was ready and hungry to play,” McCoughtry said. 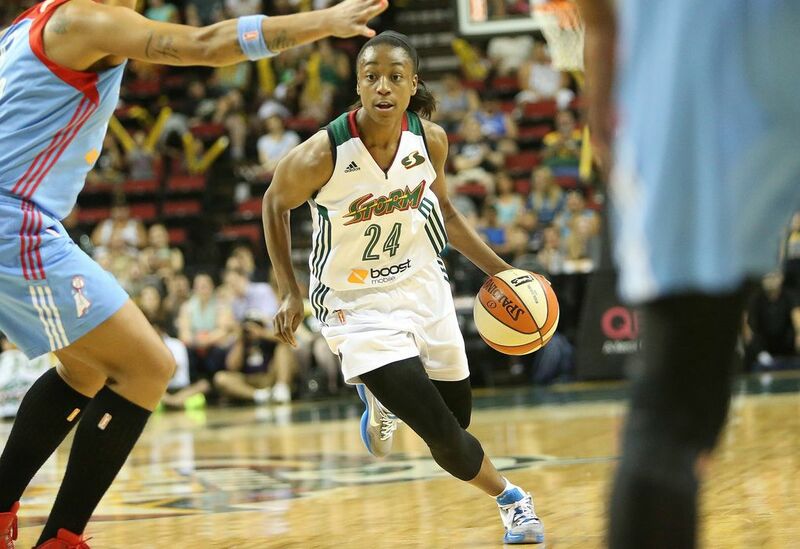 Loyd’s situation has symbolized the peculiarity of the 2015 draft class at the midway point of the WNBA season. The 5-foot-10 guard used a league exemption to enter the draft early, but her early struggles have depicted a player who was not ready for the league. Loyd’s Storm teammate, Kaleena Mosqueda-Lewis, was the long-projected No. 1 overall pick who instead was selected third overall. She hasn’t played in five of the Storm’s 17 games because she wasn’t ready, first-year coach Jenny Boucek said. Of the other 10 first-round picks this year, two are out because of injury, one has been traded, and three (including Loyd) average more than 20 minutes per game. When WNBA All-Star Game reserves are named Tuesday, the class could be the first since 2009 not to include a rookie on either roster. Storm fans have used social media to voice their frustration. The front office was transparent in stating the organization is rebuilding with Loyd and Mosqueda-Lewis as the projected franchise players. Many fans wondered why they aren’t playing or wanting to start. “I get that question often,” said Mosqueda-Lewis, who’s averaging 7.7 minutes per game. She entered the league as the NCAA’s all-time leader in three-pointers and helped lead Connecticut to three consecutive NCAA championships. Mosqueda-Lewis, a 5-11 forward, is having a good time. She’s formed a bond with Japanese rookie Ramu Tokashiki over coffee and shopping trips. At practice, Mosqueda-Lewis stays late to work on her shooting and conditioning. She takes copious notes during scouting sessions and relishes time Boucek makes for the team to repeatedly run through sets. Loyd’s regimen is similar, mixing in time to work on improving her vertical leap with the hope to someday dunk in a game. “I can touch the rim now,” she proudly says. Unlike the WNBA, which often demands instant results, the Storm’s environment has been relaxed this season. Storm teammates say they have gained respect for Loyd and Mosqueda-Lewis for their approach this season. And Boucek was succinct in Loyd’s return to the starting lineup July 10 against Phoenix: “She’s ready,” the coach said. Loyd is averaging 11.5 points and 2.3 assists in her past four games — all starts. The Storm is 2-2 during the stretch. Seattle (5-12) hosts New York (10-5) on Tuesday night at KeyArena. McCoughtry agreed, Atlanta losing 86-73 to Seattle on Saturday. Loyd played a team-high 30 minutes. “She’s going to shine,” McCoughtry said.